The Save Baseline dialog box appears (see Figure 10-1). Figure 10-1. 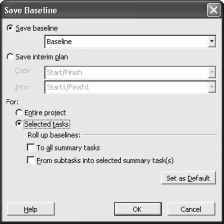 Use the Save Baseline dialog box to save up to 11 baselines or up to 10 interim plans. 2 Make sure that the Save Baseline option is selected. 3 In the box under the Save Baseline option, make sure that Baseline (not Baseline 1 or Baseline 2) is selected. 4 Under For, make sure that the Entire Project option is selected. Although nothing appears to happen, as soon as you click OK, all your scheduled fields are copied into their corresponding baseline fields. The value stored in the Cost field is copied into the Baseline Cost field. The value stored in the Work field is copied into the Baseline Work field, and so on. 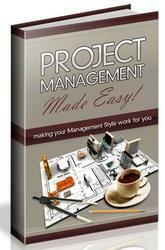 In the Gantt Chart or another task sheet, select the tasks that you want to add to the baseline. 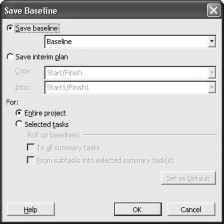 Click Tools, Tracking, Save Baseline to display the Save Baseline dialog box. Make sure that the Save Baseline option is selected. Under the Save Baseline option, make sure that Baseline is selected. The Baseline box lists the date you last saved the baseline. If you want to add tasks to a different baseline, for example, Baseline 1 or Baseline 2, click that baseline in the list. Under For, select the Selected Tasks option. When you select the Selected Tasks option (see Figure 10-2), the Roll Up Baselines check boxes become available. This option ensures that the summarized baseline data shown in summary tasks are accurate and rolled up the way you expect. Figure 10-2. When you save a baseline for selected tasks, you can choose how to update the corresponding baseline data on summary tasks. 5 Select the check box that reflects how you want the baseline information of the selected task to be rolled up to summary tasks. By default, after the initial baseline is saved, a summary task is not updated when a subtask is modified, added, or deleted. If you want the selected tasks to be rolled up to all associated summary tasks, select the To All Summary Tasks check box. If you want the selected tasks to be rolled up only to a selected summary task, select the From Subtasks Into Selected Summary Task(s) check box. 6 Click OK and then click Yes to confirm that you want to change the existing baseline. When saving a baseline, click the name of the baseline that has a Last Saved date. Under For, select Entire Project or Selected Tasks to specify whether you want to overwrite the baseline information of the entire project or only of selected tasks. 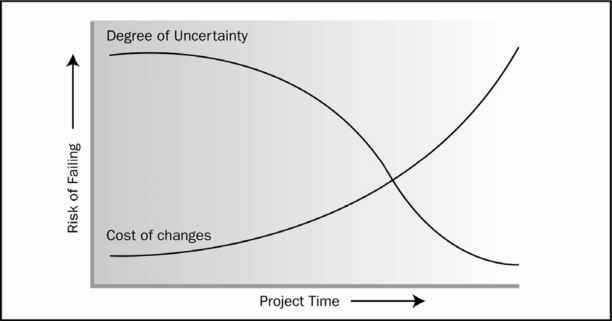 The current schedule information in your project plan overwrites the baseline information in the selected baseline.